BAKU—Azerbaijani writer Akram Aylisli, who has been branded as “anti-Azeri” for writing about the Baku pogrom of Armenians was detained at Heydar Aliyev International Airport and taken to the police custody, Turan news agency reports. 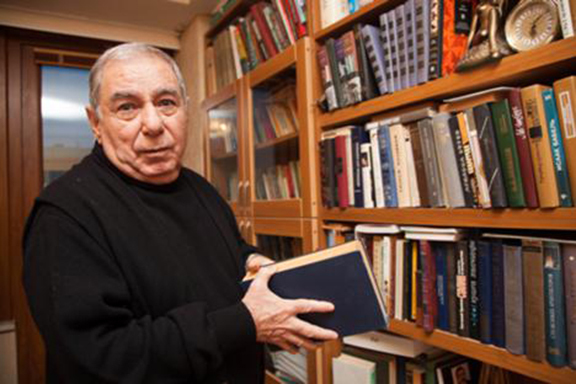 According to the writer’s wife, on March 30, at 5:11 a.m. local time, Aylisli together with his oldest son, Ilias, was to fly to Venice to participate in an international book festival, but the customs agents did not allow him to pass, saying his exit from the country was prohibited. Considered a literary legend in Azerbaijan and honored with various national accolades. in 2013 Aylisli’s novel, “Stone Dreams” was published in the Russian magazine, “Friendship of Nations.” In the novel, the author describes the massacres of Armenians in Baku in 1990 and in Nakhichevan in 1919. Ayisli also has positive things to say about Armenians in his novel. Immediately after the publication of the novel, the author was branded as being “pro-Armenian” and was stripped of his national honors, as well as his pension by President Ilham Aliyev, whose predecessor and father, Haydar, was also criticized in the book. He was exposed to harassment by various Azerbaijani factions, including a pro-government youth group holding a rally in front of his house and members of parliament urging the public to burn his books or calling on the government to deport him. President Aliyev accused him of “deliberately distorting the history of Azerbaijan” and “in distorting realities about history of Azerbaijan in an inappropriate way.” The leader of the pro-governmental party ”Modern Musavat” Hafis Hajiyev announced that he would pay about 10 Euros to the person who would cut the writer’s ear. The U.S. Department of State and the OSCE Office in Baku condemned persecution of Aylisli in Azerbaijan and called on the authorities to fulfill their obligations.